New varieties of fruit are named for all shorts of reasons and, for instance, after places, events and people. Charles Ross honours the head gardener who bred this handsome apple at Newbury in Berkshire. Annie Elizabeth, the long keeping culinary apple with especially beautiful deep pink blossom commemorates a nurseryman’s baby daughter who died in infancy. Now we have Julia’s Late Golden named by Mary Hember after her daughter who died far too young in her early thirties from leukaemia. The apple is a chance seedling that sprang up in a rough patch of ground at the bottom of Mary’s garden in Codford, Wiltshire and introduced by the Triscombe Nurseries of Somerset. In September 2002 the Hember family first noticed a rather tall and slender tree growing behind a large willow. ‘Why did you plant an apple tree there’ asked Julia. But it was not planted and in Mary’s words ’it had arrived unbidden, the product of a core thrown into the shrubbery which had grown unnoticed for two or three years.’ The tree, although overshadowed by the willow, was laden with golden fruit. These proved good to eat, excellent for ‘Tart Tatin’ – as the slices of apple kept their shape when cooked – and it made a flavoursome juice. 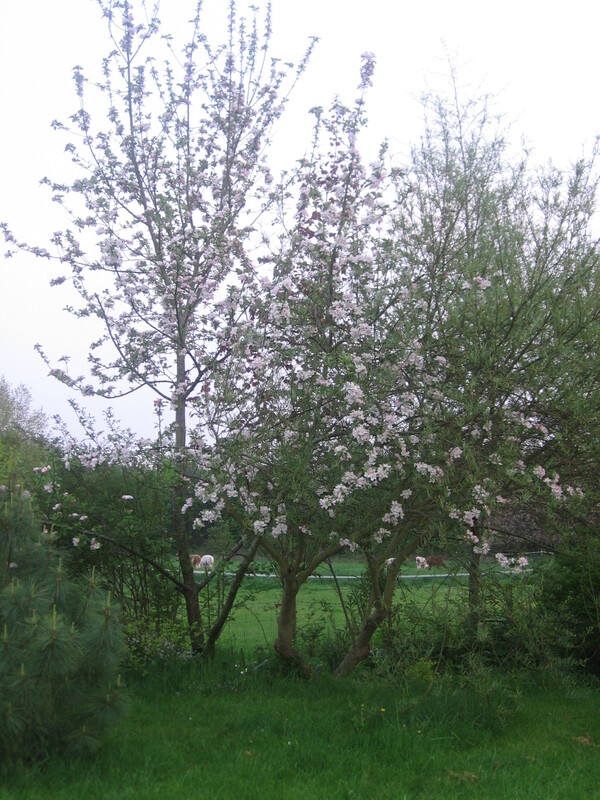 In the following years the tree cropped heavily and regularly and it flowered late giving the blossom a good chance of escaping any late spring frosts. The fruits ripened to deep yellow, often blushed with colour, and stored well. This chance seedling had produced a multi-purpose apple with a number of points of recommendation. Mary decided to bring the apple to wider notice and at the same time raise funds for research into leukeamia, the disease that had so cruelly taken Julia’s life away in 2003. Triscombe Nurseries agreed to propagate trees, a bundle of scion wood went off from Wiltshire to Somerset and the Nurseries introduced ‘Julia’s Late Golden’ in their 2007 catalogue. For every tree sold a donation is made to Saint Bartholomew’s Hospital in London, where Julia was treated. Wiltshire has adopted Julia’s Late Golden as one of the county’s own indigenous apples. Wiltshire Wild Life Trust is planting it in their community orchards and it has even found a place in a royal garden. When the Queen visited Wiltshire in 2012, she was presented with a tree, which is now growing at Windsor Castle.